LX10 Studio Two-Stage Aluminum Tripod System and H65B Head with Dual Pan Handles and Spreader Dolly is rated 5.0 out of 5 by 1. Rated 5 out of 5 by Jeff the TV guy. from Rock solid; pro-level gear We bought this tripod rig completely on the suggestion of the B&H staff, and we could not be more pleased with it. The whole unit is solid as a rock, glides smoothly on the wheels, and adjusts very easily. Assembly was a snap, and mounting camera rigs is simple and solid. We bought the unit based on its ability to hold heavy weight, and we use it to hold a full camera & teleprompter rig. The whole assembly weighs in at 30+ pounds, and it rides easily on this tripod - and feels completely secure. The two handles are fully adjustable, and they are nice and long. Plenty of control. The rig is supposed to be used as shown... on the wheel base. 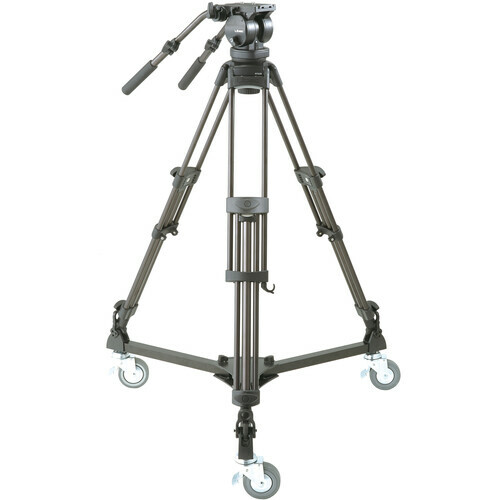 So they did not include regular feet for the tripod to be used off the wheel platform. This would have been a nice extra, as the tripod could then have been used outside the studio, but even without this, the whole package is a definite A+.? And in this price range, it is a complete home run.